2017 marks 30 years since services were withdrawn from the UK’s first guided busway in the northern suburbs of Birmingham. 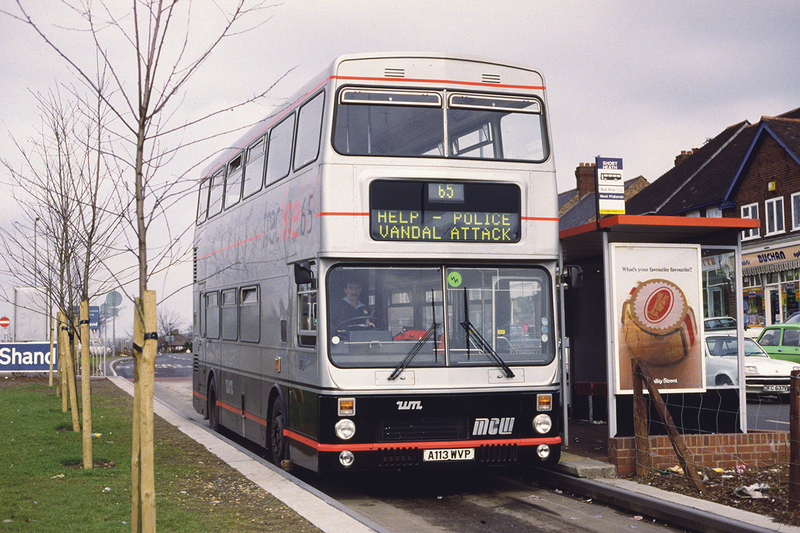 The Tracline 65 600m demonstration project, a co-operation between the then West Midlands County Council and WMPTE, had been in operation since the autumn of 1984 as part of state of the art (of that era) improvements to WMPTE service 65 between the city centre and Short Heath. 14 guided double deckers, thought to be the world’s first so equipped, were procured from MCW and given a distinctive livery for the service. Technically, there was no doubt that the guided section was a success although it was practically of little use, being in the median strip of a lightly trafficked dual carriageway in an outer suburban housing development. Marginal viability of the 65 service would prove to be the busway’s downfall. At deregulation, West Midlands Travel (WMT), the arms length successor to WMPTE, only registered the weekday service commercially and failed to gain the contract for the Sunday services. 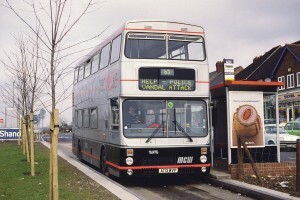 Midland Red West operated these with conventional vehicles serving alternative stops on the main carriageway. The end apparently came quickly, in an effort to improve viability, attempts were made to remove the premium paid to drivers for working the guided section. When this was not accepted, the service was diverted onto the conventional carriageway and the dedicated vehicles were repainted and dispersed around the fleet. The busway was returned to nature although signage saying ‘except guided buses’ remained near the terminus to be ignored by conventional vehicles for many years. Whilst the busway itself had a short life, this was not the case for the majority of the vehicles bought to service it. Dispersed to other depots, they were included in WMT’s extensive refurbishment programme undertaken by Marshalls of Cambridge in the 1990s and remained in service well into the new Millenium. Many then passed to other operators, a number reaching a quarter century in service. 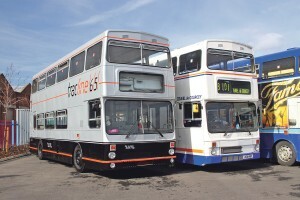 The final two with their original owner, now National Express, were withdrawn from the Travel Coventry operation in 2005 and sent to Miller Street in Birmingham for sale at a forthcoming auction. Safely inside the original Aston Manor premises after collection from National Express in 2005. Members and friends at Aston Manor Road Transport Museum (AMRTM), then still in Aston, had identified the historical importance of the busway vehicles sometime previously and negotiated with National Express to acquire one of the two in the auction. Following a detailed assessment by the museum team, the chosen vehicle (2970 (8110) A110 WVP) arrived at the museum in May 2005. The second vehicle would subsequently attract the highest bid of any of the large number of Metrobuses sold at that auction. AMRTM already had a variety of artefacts celebrating the busway including guidewheel assemblies and a dot matrix destination display, items which were removed from the vehicles on cessation of busway use. More significant changes had been made during the refurbishment programme at Marshalls including structural strengthening at the rear resulting in a smaller rear window and retrimming in a blue moquette. In preparation for the restoration to original condition, most of a set of seat squabs and backs in original autumnal colours were obtained, some in unused condition in their original packaging. 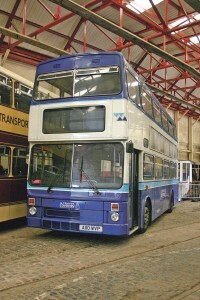 A significant investment was also made in a complete unused fibre glass rear panel to the original Metrobus Mark2 design once the museum’s engineering team had confirmed that this would fit without impacting on Marshall’s structural changes. A replacement front grille panel with non standard for WMPTE central registration plate was also sourced. The relatively bright interior. Some autumn pattern components are still required for the rear seats. Whilst much of the internal work was undertaken by AMRTM volunteers, external resources were employed to complete the exterior work. 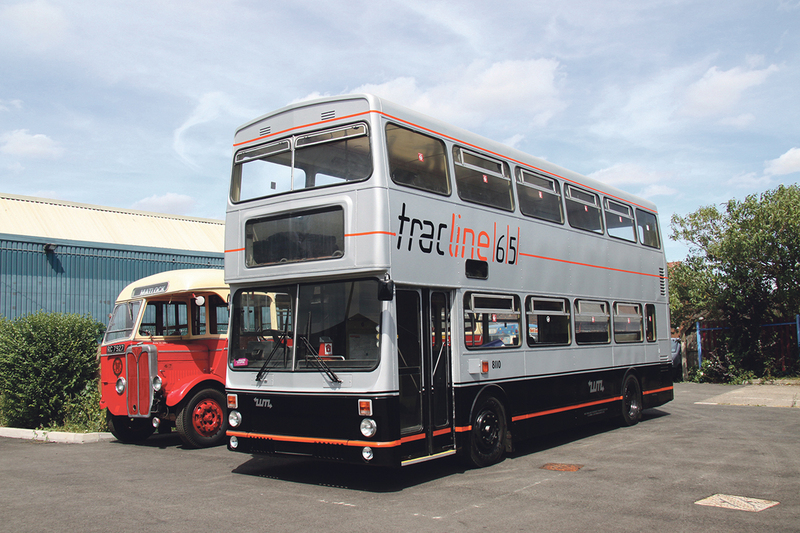 Fitting the new back panel and general exterior refurbishment was undertaken by Trailways at Bloxwich whilst the National Express paint shop team at Walsall professionally applied the original silver and black livery. 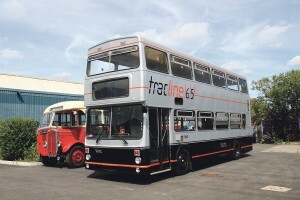 Cosmetically almost complete externally, the bus was displayed at Aston Manor’s summer open day in July 2010 where it attracted a lot of attention. Close up of the reinstalled guide wheels, note the reflector. At that time, no one expected it to be a further six years before the bus would be back on the road but two museum relocations and some niggling mechanical problems delayed work. It was 8 October 2016 before it was submitted successfully for MOT, just in time to be exhibited at The Transport Museum, Wythall’s 30 years since WMPTE event. The following week, it carried its first passengers for eleven years when it collected the Brownhills Methodist Church Wednesday Club for a visit to the museum. It operated on the museum’s event shuttle to Walsall during the running day on 16 October and again during the collectors fair on 20 November. 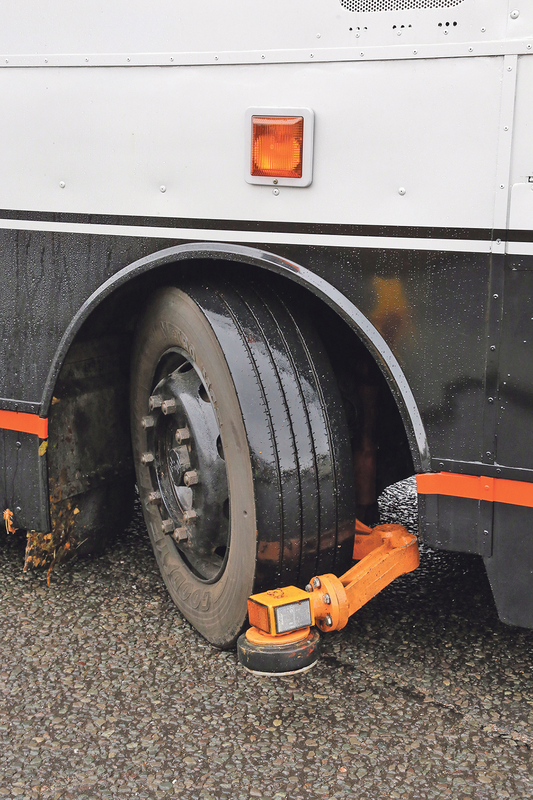 In its restored state, the bus once again has guide wheels installed on both sides and a dot matrix destination, albeit of a more modern design. A journey into Walsall and back in dismal weather during the collectors fair showed steady performance from the Gardner 6LX engine and a surprisingly quiet and steady ride. A year later progress was being made with reinstalling the interior. At an open day, it was displayed alongside numerically the first of the Tracline vehicles, then nearly 27 years old and still in service with Travel DeCourcey in Coventry. The interior is distinctly functional, the project may have been state of the art but once aboard, the atmosphere is standard 1980s bus. With light coloured laminates on the sides and ceiling together with the (recovered) light grey floor, it is quite bright inside and the limited number of vertical stanchions give an uncluttered look. There is still work to do, in particular some parts of the rear bench seats are still in the blue retrim moquette whilst the correct style is sourced. In Summer 2010, the Metrobus returned to Aston Manor after external refurbishment. Saturdays and Sundays from 3 January. The first special event of 2017 where members of the museum’s operational fleet will be running is an evening of ‘Buses by Night’ planned for 18 February. Further events follow on 26 March and 23 April.